Lunarfurniture.com – Despite of the reality that house is included in the three main basic needs of human; it is hard to be owed by some people nowadays. As we know, the price of house, both when we want to build or buy, is highly raising. The rises of land’s price and also the building material’s price are the main reason why the house’s price is extremely expensive nowadays. There is a solution made by the government and house builder by providing the small size house which has lower price which might be easier to be bought. This small size house is a good solution for people who only have small amount of money but still want to get a house to stay. The problem is, this small size house won’t give much chance for the house owner to express themselves, especially in making some experiment of the house. Well, you don’t need to be worry if you are one of the small house owners, there is a good solution for this problem. An architect named Beriot Bernardini has a smart solution for small size house, where he can modify so many small rooms as the multifunction rooms and even he only uses the triplex as the main material of those multifunction rooms! 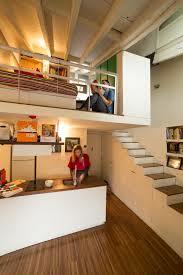 In his experiment, Bernardini uses 28 square meters apartment which has 3.6 meters high ceiling. He maximizes the height of the ceiling by making many vertical storage cabinets/rooms. The ceiling’s height provides Bernardini ideas where He can create the apartment just almost look like a two stories apartment. In the lower room, he builds locker room, bathroom, dining room and kitchen, or even cabinet room; meanwhile, the fake second floor can be the place for the bedroom and some other storage rooms. The unique thing found in this apartment is that the lower and upper room is connected by a stair which can be used as the storages cabinet. This idea is very good in minimizing the amount of cabinet. In order to giving the wide illusion of the apartment, Bernardini paints the whole apartment area with white and arranges the whole interior structures so that the light from the window can fulfill the needs of light and the air circulation of the apartment.